A pre-Canaanite tribe, dwelling (according to Josh. xi. 21, 22, and Judges i. 10, 20) in the hill country of Judah and in the Philistine plain (Hebron, Debir, Anab, Gaza, Gath, Ashdod). Three clans are mentioned: Sheshai, Ahiman, and Talmai (Judges, i. 10; Num. xiii. 22). These names seem, from their form, to be Aramaic; but what this fact signifies is not clear. The Anakim are said to have been conquered by Caleb (Josh. xv. 14; Judges, i. 20), who received their territory. In Deut. ii. 11, the Anakim are called a branch of the Rephaim, which is perhaps a generic term. The Hebrew of Num. xiii. 33classes them also with the Nefilim; but the clause is not in the Greek, and is probably a late gloss. In Judges, i. 10, the conquest is ascribed to Judah. How far the Anakim had been absorbed by Canaanites and Philistines is uncertain. On the genealogy in Josh. xiv. 12-15 and xv. 13, see Hebron and Kirjath Arba. According to rabbinical tradition (Gen. R. xxvi. ), the Anakim are of the same Titanic race as the Rephaim, Nefilim, Gibborim, Zamzummim, and Emim. The name (as though containing the element 'anak = neck) is explained in the Midrash (Gen. R. xxvi.) as indicating that they wore "neck-chains heaped upon neck-chains," or, as if from the verb "to press," "force," that they seized the solar disk and cried, "Send us rain," or that "they squeezed their heads into the sun" (Soṭah, 34b; see Rashi on Yoma, 10a). Of the three sons of Anak who filled the spies with awe and fear by their gigantic stature, Ahiman, Sheshai, and Talmai (Num. xii. 22-33), the first is represented in Num. R. xvi. and Tan., Shelaḥ, 7, ed. Buber, 11, as challenging passers-by, saying: "Whose brother will fight with me?" (a play upon "Ahiman" = brother of whom); the second stood there stolid as a block of marble (a play upon shesh = marble), and the third made deep furrows (a play upon telamim = furrows) in the soil with every step. (Compare Soṭah, 34b; Yoma, 10a, which has a somewhat different and possibly corrupt version; see Buber, notes to Tan. l.c.) And when the spies saw these men towering up to the sky and looking as if piercing the sun, they were afraid and said: "We are not able to go up against these people, for they are stronger than He [ ]; that is, stronger than even the Lord Himself!" (Num. xiii. 31). "The daughter of Anak had gone into her father's garden and taken a pomegranate, which she ate, after having peeled off the skin and cast it aside. Then the twelve spies came and, seeing her father, were struck with fear and hid themselves under the pomegranate-skin, believing it to be a cave. The daughter of Anak in the meantime came back and, seeing the pomegranate-skin still lying there, was afraid lest her father might scold her for lack of neatness. She therefore took the pomegranate-skin, with the twelve spies hidden therein, and cast it out of the garden, noticing the weight added by the men no more than if the skin had been the shell of an egg." The legend bears a striking resemblance to the story of the giant's daughter reprinted in Grimm's "Kinder und Hausmärchen" (compare Chamisso's "Riesenfräulein"). 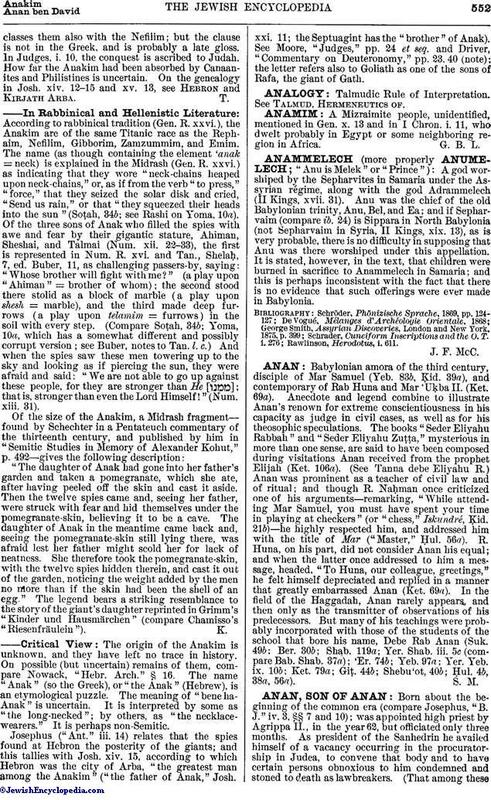 The origin of the Anakim is unknown, and they have left no trace in history. On possible (but uncertain) remains of them, compare Nowack, "Hebr. Arch." § 16. 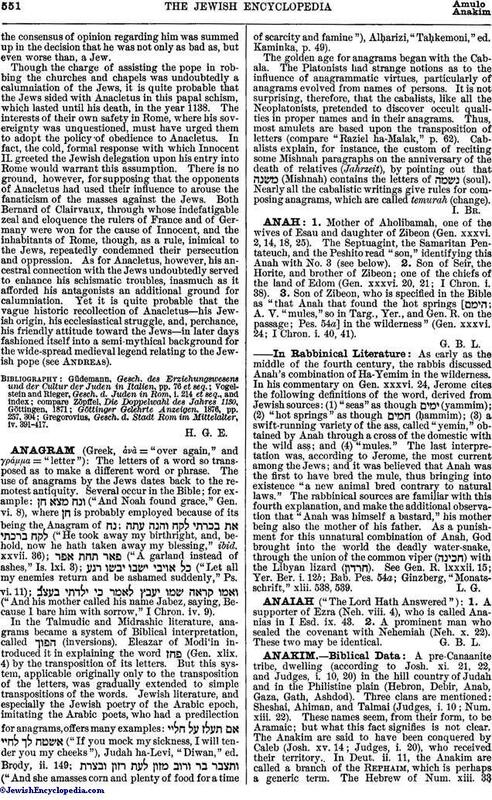 The name "Anak" (so the Greek), or "the Anak" (Hebrew), is an etymological puzzle. The meaning of "bene ha-Anak" is uncertain. It is interpreted by some as "the long-necked"; by others, as "the necklace-wearers." It is perhaps non-Semitic. Josephus ("Ant." iii. 14) relates that the spies found at Hebron the posterity of the giants; and this tallies with Josh. xiv. 15, according to which Hebron was the city of Arba, "the greatest man among the Anakim" ("the father of Anak," Josh. xxi. 11; the Septuagint has the "brother" of Anak). See Moore, "Judges," pp. 24 et seq. and Driver, "Commentary on Deuteronomy," pp. 23, 40 (note); the letter refers also to Goliath as one of the sons of Rafa, the giant of Gath.